All Dock Universal Charger For Your Smartphones and Tablets | OhGizmo! Gadgets have become nearly permanent fixtures in people’s lives these days. Without their phones, music players, or tablets, some people feel incomplete, ill at ease, or inconvenienced, and it makes sense, considering how these devices are used. It’s fine and dandy if you’ve got a few dozen outlets at home, but if you’ve only got a limited number of them (like most people do), then keeping these gadgets powered up can become quite a hassle. One solution is the All Dock. It’s a charging dock for multiple devices so the number of chargers you’ll need for multiple gadgets drops down to one. It’s compatibility with gadgets from multiple manufacturers, including Apple, Android, Samsung, Sony, HTC, Kindle, Nokia, and Huawei, is a definite plus. The All Dock boasts of a 2400mA per USB exit, so your phone will be charged up to 80% in less than sixty minutes. In addition to the slots, the dock also comes with active USB hubs. The All-Dock will be compatible with the most common standard connectors like Lightning, 30-pin, micro-USB, etc. which can all be attached to the 4x or 6xUSB hub. The All Dock is currently up for funding on Kickstarter, where a minimum pledge of $59 will get you one of your very own. Thanks for this great write up! 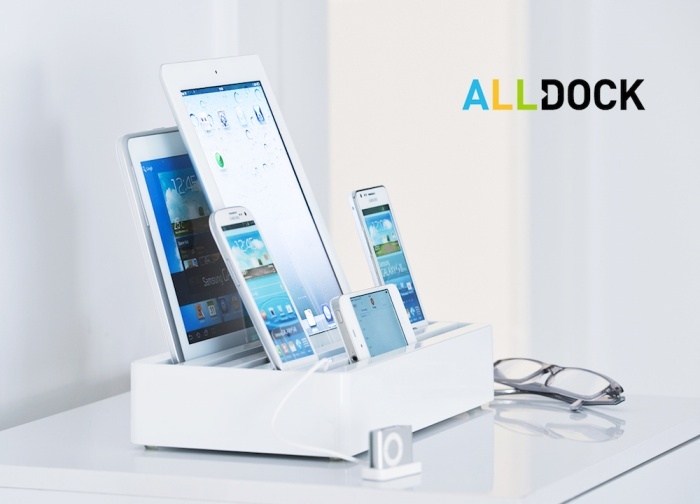 We’re very happy with how the All-Dock has been received, both in the US and worldwide. The support for the product, from its design to the generous funding through kickstarter, to product delivery, has been unbelievable.